Bethlehem Tilahun Alemu is founder and Managing Director of soleRebels, the world's fastest-growing African footwear brand and the only Fair Trade-certified footwear company in the world. Growing up in a poor suburb of Addis Ababa, Bethlehem decided that there was only one way to defeat poverty – use local craftsmanship to make products that can compete in the global marketplace. She decided on footwear and today 70,000 pairs of shoes leave her factory every year. soleRebels has been expanding rapidly and has 18 stores around the world, including in Silicon Valley (USA), Japan, Singapore, Austria, Greece, Spain and Switzerland, along with an aggressive e-commerce marketing strategy. It expects to open another 50 to 60 stores in next 18 to 36 months. In 2015, Bethlehem launched an new venture, Republic of Leather, offering bespoke, hand crafted Leather wear and accessories. From the humblest of beginnings, Bethlehem has built soleRebels into the planet's fastest growing African footwear brand and the very first global footwear brand to ever emerge from a developing nation. She has created world class jobs, and empowered her community and country, whilst presenting a galvanized, dynamic face of African creativity to the global market. Bethlehem was born and raised in the Zenabwork/Total area of Addis Ababa, one of the most impoverished and marginalized communities of Ethiopia. Growing up Bethlehem saw that Ethiopia had plenty of charity “brands” but not a single global brand of its own, so she set out to change all that. In early 2005, fresh out of college in Addis Ababa, Bethlehem founded the trailblazing footwear company soleRebels to provide solid community-based jobs. Tapping into her community’s and the nation's rich artisan wealth and heritages, Bethlehem started re-imagining what footwear could be. Seven years, many shoes and hundreds of creative, dignified and well paying jobs later, soleRebels is the planet's fastest growing African footwear brand and the world’s first and only World Fair Trade Federation [WFTO] Fair Trade certified footwear company. Constantly elevating the idea of what her brand can achieve, Bethlehem has led soleRebels to become the first ever brand from a developing nation to open branded, stand-alone retail stores around the globe including in Asia and the EU. soleRebels is on track to be the first global branded retail chain from a developing nation to open 100 stores and achieve over $100 million USD in revenues by 2017. What's behind the name soleRebels? "That was a piece of beautiful serendipitous poetry that sprang from the whole idea of giving deeply marginalized folks who once had NO HOPE, the chance to become self sufficient, independent and FULL OF HOPE by crafting innovative FOOTWEAR from recycled tires, inner tubes, organic cottons + other great natural materials! we said “now THAT is being a sole Rebel!” It was a magical bonus to our whole idea but one that we still believe in passionately to this day." soleRebels business model provides a living and breathing example of what can happen when young and motivated grassroots African entrepreneurs take on the global market, compete and win. Entrepreneur Bethlehem Tilahun Alemu is on a mission, to encourage consumers around the world to taste hand-roasted Ethiopian coffee. Her company, Garden of Coffee, produces a brand that uses artisanal methods to source, process, roast, and package Ethiopia’s legendary beans. This month sees the brand venturing into an exciting and potentially vast new market, China, traditionally a tea loving market but one whose taste buds are now developing a love for coffee. Bethlehem Tilahun Alemu, the pioneering and enterprising creator of the inspirational SoleRebels ethical footwear brand, and Republic of Leather, her business venture that puts Ethiopia’s handcrafted leatherwear and accessories on the global map, believes the future of a truly sustainable specialty coffee market can be found in coffee’s birthplace, her native Ethiopia. After more than a decade of building SoleRebels into a global footwear and leather goods brand that combines traditional Ethiopian craftsmanship and materials with fresh new designs while also paying top dollar throughout the supply chain, Alemu late last year launched an equally ambitious new coffee venture called Garden of Coffee. Ethiopian entrepreneur Bethlehem Tilahun Alemu addressed the 2016 UN Global Compact Leaders Summit at the United Nations headquarters in New York last month, invited to speak in a session aimed at highlighting those global game-changers who have demonstrated their ability to change mindsets. "It is not footwear we are producing - it's a kind of art," explained Bethlehem Tilahun Alemu, who founded soleRebels in 2005 in the neighbourhood where she grew up, after realising skilled residents lacked job opportunities. Bethlehem Tilahun Alemu is a tireless foot soldier taking Ethiopian entrepreneurship to the world. She is building a $20-million shoe factory in Addis Ababa and is also soon launching a coffee brand. 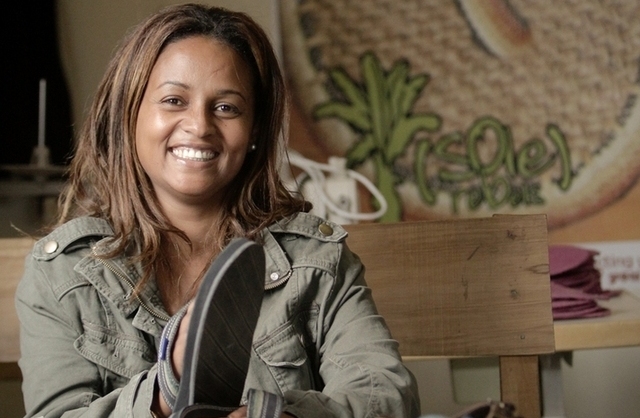 As part of International Women's Day celebrations ILO News spoke to Bethlehem Tilahun Alemu, a young Ethiopian entrepreneur who has created one of the world’s fastest growing footwear brands by betting on decent work. Bethlehem Tilahun Alemu is a woman passionate about leather, especially when its handcrafted by talented artisan craftsmen and women in her home country, Ethiopia. So much so, that Bethlehem, who has achieved great success with her global shoe brand soleRebels, has in 2015 launched a new business, Republic of Leather, which creates bespoke, handcrafted luxury leatherwear for men and women. Given Bethlehem's track record of success as a leading woman entrepreneur we are sure her new venture is headed for great things. When Bethelhem Tilahun, co-founder of global brand soleRebels, spoke at a recent entrepreneurship conference she highlighted the challenges entrepreneurs face when protecting their intellectual property in Africa. Published on Jul 19, 2016 --- Gathering leaders from business, civil society, Government, the UN and academia, the UN Global Compact Leaders Summit highlighted how the newly adopted Sustainable Development Goals (SDGs) provide a tremendous market opportunity for business and other stakeholders to innovate, invest and collaborate to create a more sustainable future for all. In this video is Bethlehem Tilahun Alemu the Founder and Executive Director of soleRebels. Ethiopian entrepreneur, Bethlehem Alemu, has become one of Africa's most renowned shoe designers, with her SoleRebel brand of shoes made from recycled car tyres. Here she is featured on the South African news channel ENCA. The Ideas Exchange is a series from the BBC exploring the minds shaping global business. It pairs up business leaders from around the world to discuss today's business landscape and their secrets to success. In this edition, Ethiopian entrepreneur Bethlehem Tilahun Alemu the founder and managing director of SoleRebels, which makes shoes out of recycled materials meets up with Jorgen Vig Knudstorp the CEO of Danish toymaker and major international brand, Lego. They discuss today's business landscape and their secrets to success. Featured in the United States as part of the Black History Month series, VOA's Diane Butts showcases Ethiopian entrepreneur Bethlehem Tilahun Alemu and her flair for shoes. soulRebels founder, Bethlehem Alemu and YouGovStone founder, Carole Stone give advice and take questions on how to be an entrepreneur in this Special Session at the One Young World Summit 2013. The One Young World Summit 2013 took place in Johannesburg, South Africa. Watch this video where BBC's George Alagiah features prominent Ethiopian entrepreneur Bethlehem Tilahun Alemu. This feature was played at the Gala Night for the 2011 Africa Awards for Entrepreneurship, held in Nairobi. The Africa Awards for Entrepreneurship are sponsored by Legatum, the Omidyar Network, and Google, and this year's awards were selected by an elite group of judges, including Virgin Founder, Sir Richard Branson. "... we have embraced the idea that tradition and innovation go hand in hand, so that yesterday's hand loomer of fabrics is tomorrow’s textile innovator; yesterdays cobbler is tomorrow’s added value shoe artisan,"
"Prosperity creation is the sole route to the elimination of poverty. And to create sustained prosperity, you have to create something truly world class." "If you have a crazy idea, go for it! Don’t be afraid to make mistakes." "I wanted to do something that would give me job opportunities myself and the people around me, ... I immediately thought 'I have to start a small business!'" "As I entered college, it became clear to me that poverty alleviation is a myth and that prosperity creation is the sole route to the elimination of poverty. And to create prosperity you have to create something world class." Bethlehem Tilahun Alemu, founder of soleRebels footwear, an eco-friendly footwear company, has earned a significant international honour by being named United Nations Development Programme - UNDP Ethiopia’s Goodwill Ambassador for Entrepreneurship. "We began soleRebels to bring jobs to our community, a place where there literally were NONE." CNN placed Bethlehem at #4 of their list of The 12 Women Entrepreneurs who changed the way the world does business over the last Century , along with Coco Chanel founder of iconic fashion house CHANEL, beauty products icon Elizabeth Arden founder of ARDEN Cosmetics, Giuliana Benetton founder of global fashion house BENNETON, famed entrepreneur Sara Blakely creator of SPANX, and BODY SHOP founder Anita Roddick! FAST COMPANY Magazine followed by naming Bethlehem one of the MOST CREATIVE PEOPLE IN BUSINESS in 2013! And she was ranked #7 on the NAM’s 2013 "Trailblazers under 50" list behind US President Barack Obama [# 6] and #3 on NAW’S 2013 list of the Top Business Women In Africa. Bethlehem’s efforts to re-imagine African commerce were honored when President Bill Clinton invited her to address the September 2010 Clinton Global Initiative’s panel Supply Chains of Opportunity , making her the very first woman African entrepreneur to address the Clinton Global Initiative as a speaker and panelist. On June 22, 2011, Bethlehem was chosen from a field of deeply distinguished business leaders from across the continent and was named 2011’s Outstanding African Business Woman by the African Business Awards, becoming both the first Ethiopian and the youngest woman to ever win the award!